Having already discussed saturating wood oils and matte opaque finishes for protecting your fence it just leaves for us to discuss the water-based finishes which are seen to be the most environmentally-friendly products. 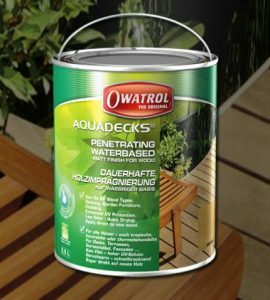 We will discuss the main features of our water-based saturating wood finish Aquadecks. The main benefit of using Aquadecks on your fence is that it can be applied to new wood without having to use Seasonite and allow it to weather first like other products. It’s a ready-to-use water-based product which is perfect for all external wood surfaces, not just your new yard fence. Available in 3 finishes (honey, movingue and teak), you can apply it to new or weathered wood with no risk of peeling or flaking. It saturates, penetrated and stabilizes the wood to minimise damage and provide a flexible, long-lasting and rich matte finish which accentuates the natural look of the wood. Also, as it is applied wet-on-wet it is incredibly quick to use! Remember first that you do not need to use Seasonite on your new wood and allow it to weather before using Aquadecks. However, you do need to treat it simply and effectively with Aquanett wood oil remover to remove any trace of mill graze, present in all new wood, which will prevent the product from penetrating the wood. This product from Owatrol is solvent free and easy to use, it takes approximately 20 minutes to work and is then rinsed off. You should allow the wood to dry thoroughly before using Aquadecks. If your wood is already weathered then the only surface preparation necessary is to clean and remove and built-up dirt and greying grime with Net-Trol and allow to dry. Once the surface of the wood is thoroughly dry (allow 2-3 days) you are ready to begin applying the Aquadecks. You will need approximately 5 m² per litre per 2 coats of Aquadecks to coat your fence and it can be applied with a brush, roller or airless sprayer (be sure to back brush or back roll afterwards to ensure and even coverage). When applying Aquadecks ensure that you work in sections that you can complete in about 15 minutes as the 2 coats necessary have to be applied wet-on-wet which means that the surface cannot be allowed to dry in-between coats. With a fence this is straight forward as you can simply work in whole panels or in sets of 2 or 3 panels depending on your speed and tools! First apply a generous coat of Aquadecks across your section and after 15-20 minutes (as soon as the first coat loses its wet look) apply a second coat, ensuring the surface did not become dry in-between. For very porous surfaces a third coat may be necessary. After 20 minutes or so of applying the second coat you should brush out any remaining puddles where the Aquadecks has not been absorbed and remember that as a penetrative product Aquadecks’ place is in the wood not on the surface. It is best to work each panel from top to bottom and ensure you do a complete panel in one go to ensure even coverage. With Aquadecks, maintenance is very simple with the wood just needing to be cleaned again and a maintenance coat of Aquadecks applied! Choose Aquadecks if you’d like a product you can apply as soon as your new fence is finished and if you’re looking for a rich matte water-based finish to enhance the beauty of your wood.